Drop shoulder style. Soft cotton faced fabric. 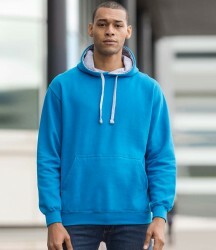 Double fabric hood with contrast inner. Contrast flat lace drawcord. Front pouch pocket. Ribbed cuffs and hem. Twin needle stitching. Tear out label. WRAP Certified Production.